I could have kicked myself when I saw Dan Meyer’s post about Gelato Fiasco‘s Frozen Code. I mean, they are literally just blocks away from my school. I didn’t use Dan’s map to launch the problem (Gelato Fisaco only has two actual stores), but just dove into the main idea that he posed. Here’s the prompt. 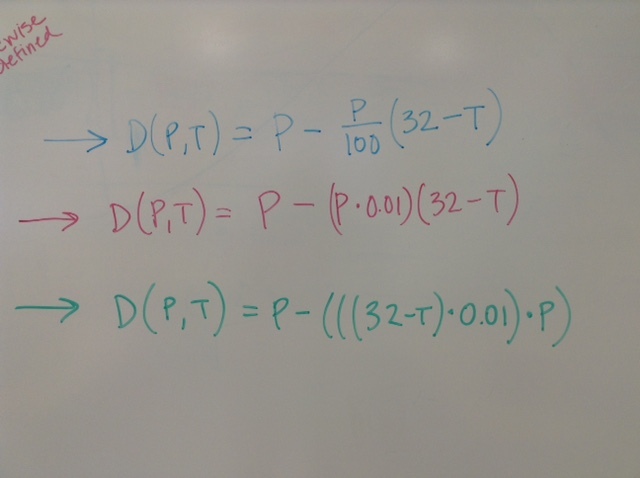 The blue group originally had just the middle rule: P(T) = 0.05T + 3.40. 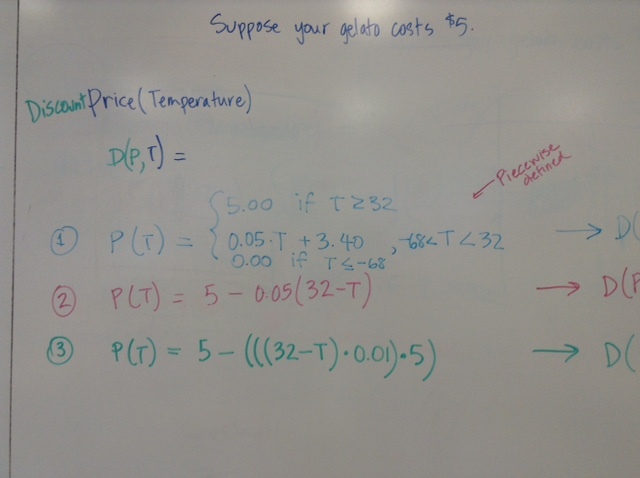 Students in both classes were eager to point out that the rule only applies if the temperature drops below 32 degrees Fahrenheit, and they wanted to somehow make that clear in the function rule. So we started to add to the definition. Then someone pointed out that there would be a bottom limit to the discount, too. After all, Gelato Fiasco might be willing to give you gelato for free if you are that willing to venture out into the extreme cold and they are still open, but they are unlikely to pay you to come in. So we added the third bit about temperatures below -68 degrees Fahrenheit. What I love about the above work is that before we got into all the piecewise stuff, I was able to ask them, “How do we know if these three function rules are equivalent?” They told me that they “generated the same results,” that they could “use algebra to change from one to another,” and that they “would all produce the same linear graph.” How cool is that? We were also able to discuss how one form easily told us the price (of a $5 gelato) when the temperature was 0 degree F and another form showed us all the calculations clearly. Once again I asked if these were equivalent and how they knew. We wondered what the graph would look like. Would it be flat or curvy? We’ll check that out tomorrow. By the way, my students think this is a pretty good marketing strategy – you are fairly likely to get some kind of discount for buying gelato in the dead of winter, but not that big a discount, on average. Last Thursday would have been a great day, though. The temperature was -10 after the sun set. Nice one ! They can now say that they have been “doing math”.